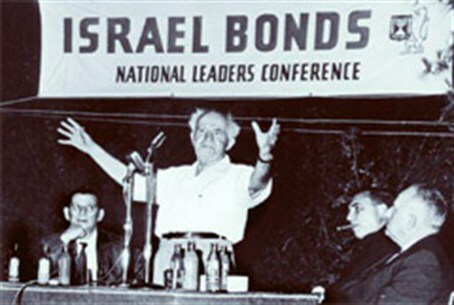 A record $225 million in Israel Bonds was set Sunday night at Miami’s annual Bonds event, attended by honoree Finance Minister Steinitz. A record or more than $225 million in Israel Bonds was set Sunday night at Miami’s annual Bonds event, attended by Guest of Honor Finance Minister Yuval Steinitz. He said that investors worldwide purchased $1.1 billion bonds for all of 2011, bringing to $33.4 billion the amount of bonds sold since their inception in 1951. Buying Bonds is an investment and not a donation, Steinitz pointed out. Israel Bonds are considered one of the safest and best investments in the world. Economic growth in Israel last year far outstripped that of the United States and most other Western countries, and the jobless rate is one of the lowest in the world. Steinitz said, “I urge every Jew in the United States to invest in Israel.” The Finance Ministry previously has emphasized, Israel has never defaulted in the payment of principal or interest on any of its internal or external indebtedness." More than 65 states and cities have invested in Israel, and proceeds are used for economic development projects for the national infrastructure and for creating jobs.